The Animal Genetics Training Resource (AGTR) is a unique, ‘one stop’, user-friendly, interactive, multimedia resource, targeted at researchers and scientists teaching and carrying out research in animal biodiversity and genetics. It is a dynamic training resource designed to help inform the design and implementation of breeding programmes and provide information that will empower countries and institutions to undertake their own research. It covers established and rapidly developing areas, such as genetic based technologies and their application in livestock breeding programmes. Teaching methods and science communication. The modules are supported by over 40 case studies that summarize real-life experiences and capture indigenous knowledge and lessons learnt from developing countries. The case studies also illustrate principles and methodologies commonly applied in animal genetics, from real-life situations and they highlight knowledge gaps appropriate for post-graduate theses or further research. A linked breed information tool incorporates all the breeds highlighted in the modules/case studies. Practical examples, exercises, compendia, a library with full-text articles, and links to relevant web resources are included. It also has links to many other information sources on and related to AnGR, including the Domestic Animal Genetic Resources Information System (DAGRIS: http://dagris.ilri.cgiar.org) and the Domestic Animal Diversity Information System (DAD–IS: http://dad.fao.org). A high quality and accuracy of the contents of the AGTR is assured through an external review process by subject matter specialists. The first version of AGTR was released as a CD in October 2003. It included the first versions of the five training modules, case studies and breed information focused on livestock breeds mainly in Africa and to a small extent in Asia. It also included a few exercises, two video clips and a library of 50 documents. The second version, released in 2006, was more expansive and comprehensive than Version 1. It was made available both as a CD and on the Web, and included additional information for Asia as well as for Africa. Version 3 is online in November 2011 on a fully web-enabled platform, which allows for direct online revisions and content comments by authors. CD versions of the same will be prepared in 2012. Significant changes have been made to the content of the Modules. All of the case studies were externally reviewed and subsequently revised, and new case studies have been added. Software manuals for word processing and presentation have been updated, and an example of using the statistical software ‘R’ (freely available) has been added. 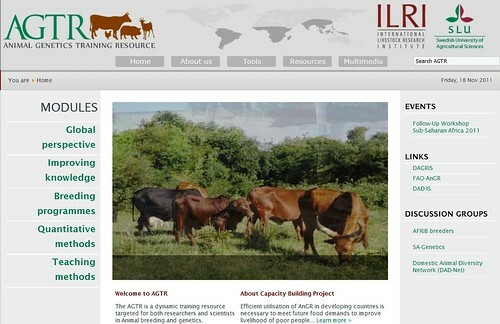 The greatly enhanced multimedia section now includes links to film and clips by ILRI, as well as pictures of numerous livestock breeds.